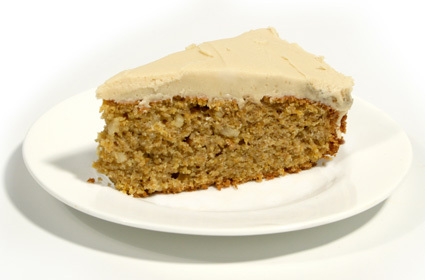 The grated carrot keeps this cake moist and the flavour improves after several days in the cake tin. The icing is of course optional. Mix in flour, followed by the grated carrots and walnuts. Pour into an oiled and greaseproof lined 20cm/8” cake tin. Bake in a pre heated oven for 45/50 minutes. Cool the cake in the tin for 30 minutes before turning out onto a wire rack. To make the topping mix together the butter, icing sugar, cinnamon and just enough orange juice to make a spreading consistency. Spread the topping over the top and sides when the cake is cold.